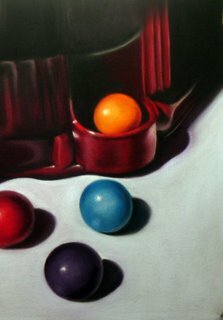 I've had a couple of photo sessions with my gumball machine, finally i've gotten around to painting one. I wasn't quite ready to do a full picture....yikes all those gumballs!! lol. So here is a tight crop. Keeping things round when using large pastels can be a challenge but it was such fun building up each gumball to achieve the roundness.